An Embraer EMB-110P1 Bandeirante suffered a gear collapse and runway excursion at Governor's Harbour Airport, Bahamas. The aircraft departed Nassau Airport at 19:00 hours local time on an instrument flight plan. Initially a Beech 1900 had been scheduled for this flight, but the airline decided to use C6-MIC, an EMB-110 Bandeirante, instead. A revised flight plan was not submitted to ATC. Weather at the destination, Governor's Harbour Airport, was poor due to heavy rainfall. The pilot in command of the aircraft initially attempted a landing on runway 15 at Governor's Harbour Airport but executed a go-around when visual contact was lost due to heavy rain. On the second attempt for landing, a decision was made to switch to runway 33 and while on final approach to runway 33, visual contact was lost again and a second go-around was executed. On the third attempt the pilot landed on runway 33, but seconds after touchdown there was a collapse of the left main landing gear which subsequently led to a runway excursion taking place. Investigators noticed that the landing gear selector switch was located in the "UP" position. Consultation with the operator's maintenance personnel and the aircraft manufacturer has determined, based on the systems operation, that if the landing gear switch is placed in the "UP" position and the gear contact micro-switch on either landing gear is contaminated with dirt, water or other contaminants, or if the switch is shorted out for whatever reason, it is possible that the gear may not retract when commanded by the selection of the gear switch. In this instance, it is possible that the gear position lights may still indicate "3-green lights" (which normally indicates the gear as being "down and locked") despite the gear selector handle being selected to the "UP" position. However, once you land or the contaminant is removed or the "system short" is corrected, or no longer exists, there is a possibility that the gear could collapse (if the gear selector switch is in the "UP" position, as was the case). The AAID believes this to be the case, as no mechanical irregularities have been found or could be replicated that would otherwise explain why the gear collapsed. 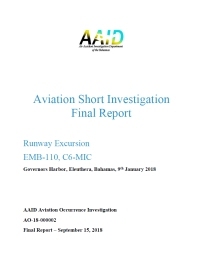 The AAID also investigated the licensing and record keeping regarding the flight crew. It appeared that the captain of the flight initially had a US FAA license. During his stay in the US, he was convicted and incarcerated for controlled substance violations. As a consequence his FAA commercial pilot license was revoked for life on 11 August 2009. After returning to the Bahamas, he applied for an Airman License Validation based on a (revoked!) Foreign License in June 2011. It is unclear if he received this validation at that time. He was issued a commercial pilot license in May 2013, which was renewed in 2015 and valid until August 2020. The AAID found that no duty time, flight time or sectors were recorded for the captain between a proficiency check was completed on March 2013 and January 9, 2018 (date of the accident). It also appeared that the Nassau-Lynden Pindling International Airport refused to issue an ID badge to the captain for unescorted access to the restricted airside, citing his US criminal record. Nevertheless he subsequently obtained an ID badge issued by the Grand Bahama Airport Company in Freeport, Grand Bahama. This was not valid for Nassau Airport, yet he managed to gain airside at Nassau without any problems. The AAID attributes this accident to "pilot error." The poor decision making exercised by the crew in attempting several landings in severe weather has been determined as the probable cause of the accident. Also contributing to this accident was the actions of the crew where, after 2 failed landing attempts and executing 2 go around maneuvers, they failed to realize the landing gear selector handle was selected in the "UP" position when the aircraft was configured for the 3rd landing. The situation was further exacerbated by additional human factor errors such as operating under periods of high stress, departing after such long delays, operating in severe weather, and flying at night- all factors experienced by the crew, which are contributory in this accident. Crew training, qualification, and authorization has been investigated and found questionable and also may have contributed to the accident.